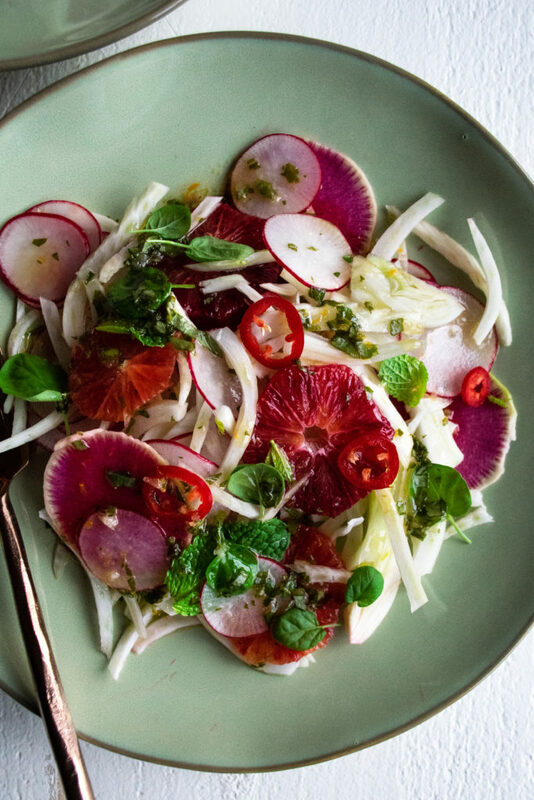 This fennel & radish salad with citrus herb vinaigrette is bright, refreshing, and everything you could need right now. I’m loving getting really creative with the idea of a salad. I’ve lately been thinking less about bowls of lettuce and more about beautiful ingredients highlighted by different flavors – sweet, spicy, earthy, tangy, etc. 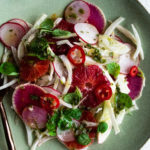 Here I’m using fennel (slightly sweet with a subtle licorice bite) and radishes (uniquely sharp and a tad bitter) to create the base of a really fresh, crunchy salad. The vegetables are tossed with an insanely flavorful citrus herb vinaigrette, plus blood oranges and chili peppers for lots of contrast. I love eating this for a light lunch or alongside a creamy soup. It’s so bright and will leave you feeling cleansed as can be! Plus, the citrus herb vinaigrette is a standout dressing all on its own. 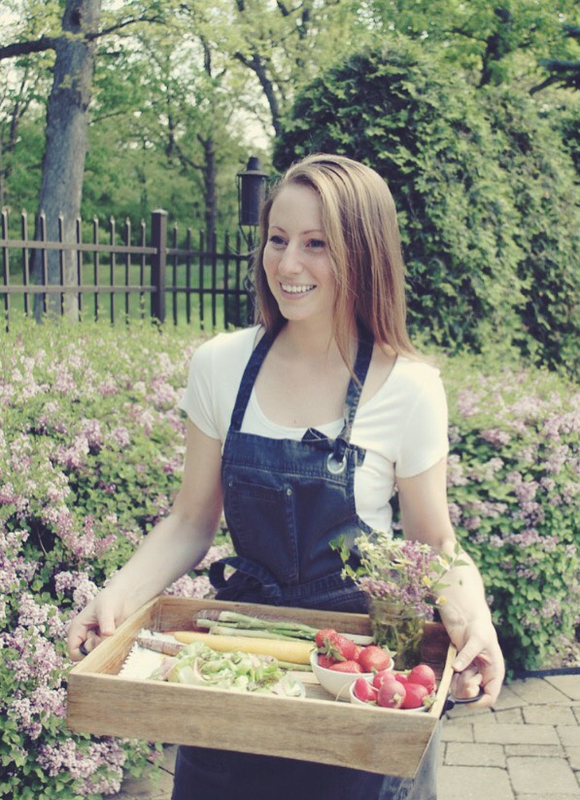 It’s got all the right flavors and works with just about anything from salads to meats. Trust me, save what you have leftover from this recipe and get creative. It’s especially good for turning what could be a bland meal into something vibrant and flavorful – you could do something like toss it with a little arugula & top your scrambled eggs and toast with it in the morning. Or, drizzle some of the citrus herb vinaigrette on top of this braised chicken dish (my personal favorite!). Combine the white wine vinegar, lemon zest, lemon juice, orange zest, orange juice, honey, Dijon mustard, shallot, and garlic in a mixing bowl. Whisk until smooth. Slowly drizzle in both oils, whisking continuously, until emulsified. Stir in all of the herbs. Season with salt and freshly cracked black pepper to taste. 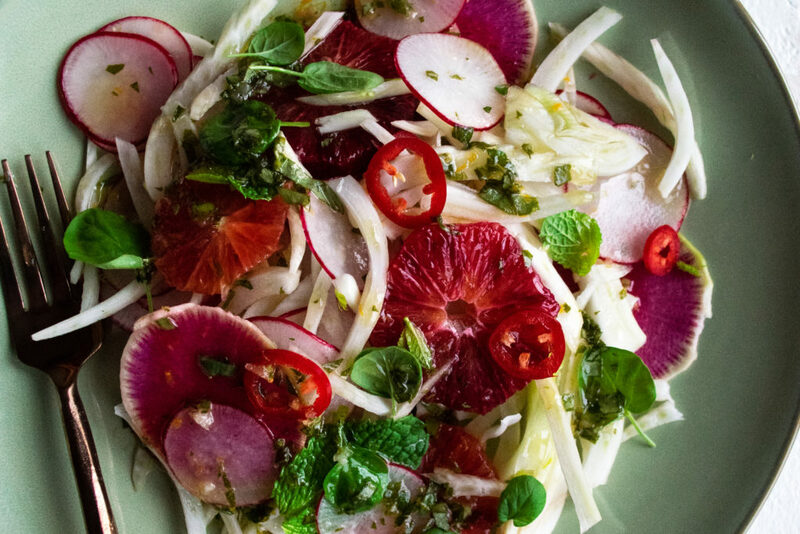 Combine the fennel, watermelon radishes, radishes, chili peppers, and blood oranges in a bowl. Drizzle in enough vinaigrette to fully coat the ingredients. Save the extra vinaigrette in a sealed container in the fridge for another use. Toss well and let the salad sit for about 5 minutes. Garnish with mint and flaky sea salt. To shave the radishes nice and thin, it’s best to use a mandolin. You’ll basically trim the ends off each radish, place one on the mandolin, and move it back and forth so that it slices very thinly. You can adjust the settings until you find the perfect width (you’re looking for a slice of radish that is almost see-through, but still has a nice bite to it).